Her sister’s sons–adorable little boys–are picky eaters, so it was big excitement for sis to include some paprika in the cracker-crumb breading for the chicken nuggets she made them last night. “You’ve done this?” she asked. “No, but it would work.” I was just trying to think of a crunchy snack the boys would like–and that she would actually serve them. Cool Ranch Doritos-covered chicken, probably not so much. We started thinking about some terrific beer-battered fish we’d made one night in early Spring, and that we could do something very similar with the chicken I was defrosting. Two chicken breasts, deboned, yielded six good-sized chicken strips, with the bones added to a bag in the freezer; that stock will become, when the bag is full, stock. The strips got a quick dredge in flour seasoned with salt, pepper, and lots of sweet Hungarian paprika, a dunk in batter made with a Rolling Rock I keep on hand for such purposes, a roll in multigrain cracker crumbs, and three minutes a side in half an inch of 350ºF canola oil. The cooked ones kept warm on a draining rig in the oven until all were finished, and were served with CSA-fresh corn and sliced tomatoes. The crust was crisp, the chicken perfectly moist. I envied the little boys their broccoli, but she tells me they probably didn’t eat that. After dinner, I dashed to the basement and returned with a cardboard paint bucket to store the leftovers. They’re not a bit oily, but the porous container will keep the crust from getting mushy. 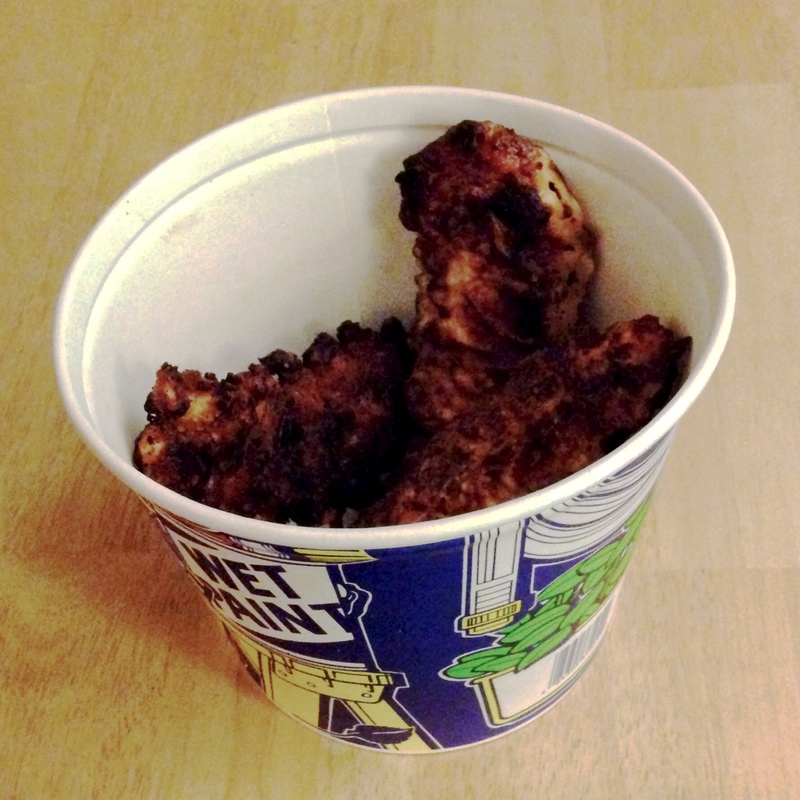 When we try Cool Ranch Doritos-covered chicken, it’ll probably have to be baked rather than fried, but I suspect we won’t need a bucket to store leftovers. The bucket says “wet,” but the chicken is not. This entry was posted in Uncategorized and tagged Chicken, Family, Wednesday. Bookmark the permalink.